The AOC e2752She is an affordable 27-inch monitor which is ideal for gaming, everyday use, and some professional work which doesn’t require accurate colors. This monitor features a TN panel with a rapid 2ms response time, solid viewing angles, and a crisp Full HD 1080p image quality. In addition, it offers some exclusive and very useful features such as the option to split the screen, access the OSD menu via a desktop application, and a few more. When it comes to gaming, 27-inch monitors seem to provide a perfect gaming experience in many video games as the screens aren’t either too big nor too small. Although a 1440p resolution is more suitable for a 27-inch due to the higher pixel density, it also requires a much more advanced computer rig. 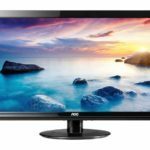 As the AOC e2752She is a budget monitor, the Full HD 1080p resolution is the perfect option as video games can run smoothly and look great without requiring a demanding computer equipment. 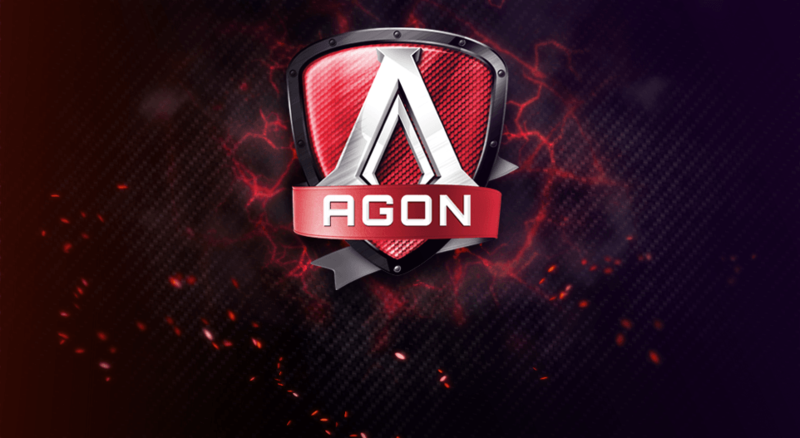 The TN panel of the AOC e2752She allows for a quick 2ms response time, another factor which is ideal for casual gaming as ghosting of the fast moving objects will be minimum; this is most noticeable in the fast-paced FPS games. However, TN panel also means less accurate and consistent quality of colors than IPS or VA panels as well as lesser viewing angles of 170 degrees horizontal and 160 degrees vertical. Alas, TN panel monitors are therefore more affordable and don’t suffer from the backlight bleeding or IPS glow. The AOC e2752She offers quite a few useful features for both everyday use and professional use. The Screen+ application allows you to split your screen into seven different layout variations. For instance, you can split your screen into four even segments into which you can drag an application and thus maintain a better overview of your multitasking activities. Furthermore, the iMenu software offers you the ability to adjust OSD settings in a desktop application rather than by the OSD buttons. The AOC e2752She is very power efficient as its power saving mode consumes 50% less power than common monitors. In addition, once it’s in the standby mode, its power consumption will amount to only 0.1W. Lastly, the eSaver application allows you to set custom timers after which the monitor will automatically shut down depending on the state of the PC (be it sleep mode, screen saver, or power off). The OSD menu is user-friendly and easily navigated. The five buttons on the bottom bezel can also be used as shortcuts when the OSD menu isn’t open. The shortcuts can be used to toggle between the picture presets, adjust the volume of the external device, and change input source. Additionally, while holding the third button for three seconds, you will trigger auto configuration. Once you’re in the OSD menu, you will be able to adjust all the standard parameters such as brightness, contrast, three different levels of gamma, sharpness, and analog settings such as horizontal and vertical position, phase, clock, etc. Under the luminance settings, you will also have access to six pre-calibrated picture settings including Text, Internet, Game, Movie, Sports, and a Standard mode. Under the Color Settings, you can set five different color temperature modes including Warm, Normal, Cool, sRGB, and User mode in which you can manually configure colors levels of the red, green, and blue colors. You can set an off timer in the OSD settings as well. 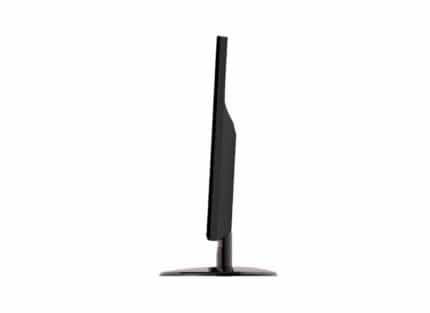 The cabinet of the AOC e2752She is glossy black while the screen has a matte, anti-glare coating. The monitor is eco-friendly as it’s made mercury-free. If you choose to hang the monitor up on the wall or on a mounting arm, you will be able to do so since it is VESA mount compatible with 100 x 100mm pattern. As far as ergonomics are concerned, it can only be tilted by -3, +20 degrees. The AOC e2752She features two HDMI 1.3 ports, a VGA port, and an audio line-out port which can be used for the convenient connecting of your headphones. Keep in mind that only one VGA cable is provided with the purchase. All of the ports face upwards so that you can easily connect all of your devices without having to guess where which port is and how it’s turned. Currently (March 2017), the AOC e2752She is available for around $185. Given the monitor’s size, unique features, responsive performance, and crisp image quality, the price is quite reasonable. In the box of the monitor, you will also receive an easily attachable base, a power cord, a VGA cable, a CD with the drivers and user’s manual, and a three-year warranty card. 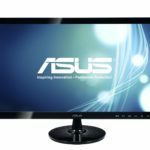 This monitor is also available as a 20-inch, a 22-inch, and a 24-inch version, you can check them as well at the following links. The AOC e2050Swd, the AOC e2228swdn, and the AOC e2470swhe. For extra $10, there is a new version of the monitor, the AOC e2775SJ, with a thinner bezel design and built-in speakers. The AOC e2752She is an excellent choice for those with a tight budget who are looking for a solid 27-inch monitor with many exclusive features, crisp Full HD 1080p resolution, and highly responsive 2ms performance. Feature such as the Screen+ will be of great help for those who need a monitor for their multitasking activities while the 1080p resolution at a 27-inch screen along the quick 2ms response time allows for fluid and smooth gameplay experience. In addition to all the other features, the AOC e2752She makes for an astonishing, cost-effective, and power-efficient budget monitor for all purposes. 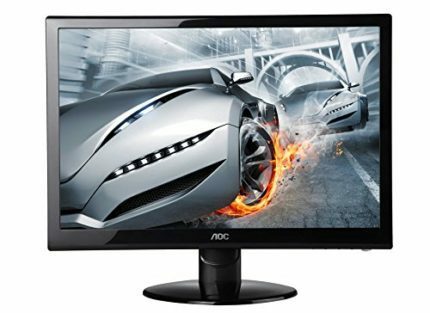 The AOC e2752She offers some unique features that are usually found in more expensive monitors such as the screen split and the desktop OSD application. This budget monitor is ideal for a low-budget computer setup as its 27-inch screen with the 1080p resolution results in a stunning image quality without demanding a powerful computer gear.